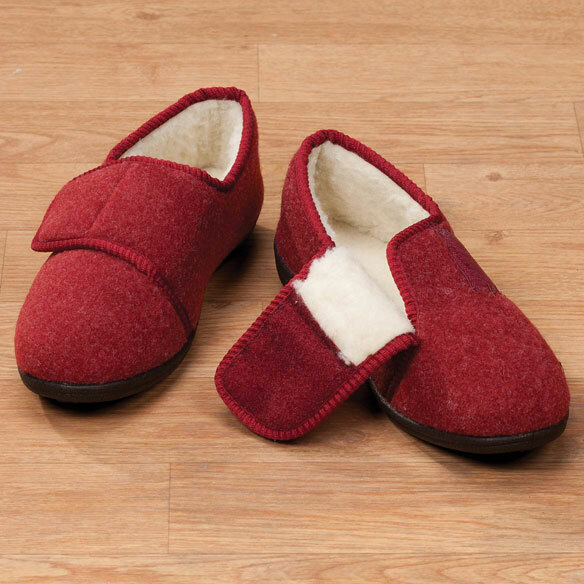 Adjustable slippers treat feet to the toasty warmth of a slipper with the protection of a shoe. 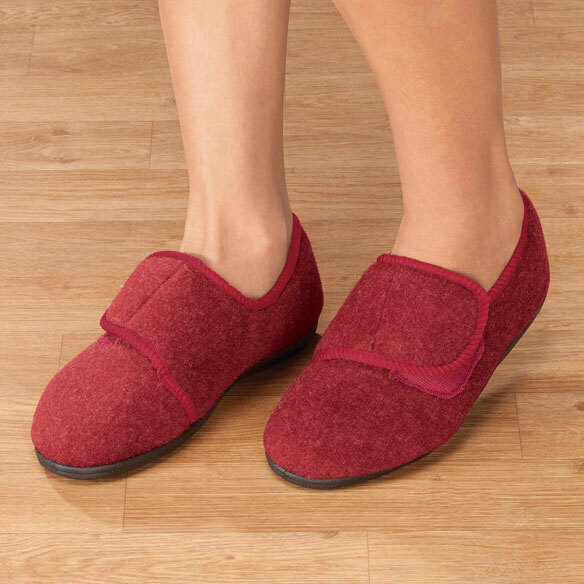 Designed for maximum comfort indoors or out, this adjustable indoor/outdoor slipper is perfect for trips to the mailbox, enjoying your morning coffee on the patio or lounging around the house in style. Plush sherpa lining surround feet in comfort. 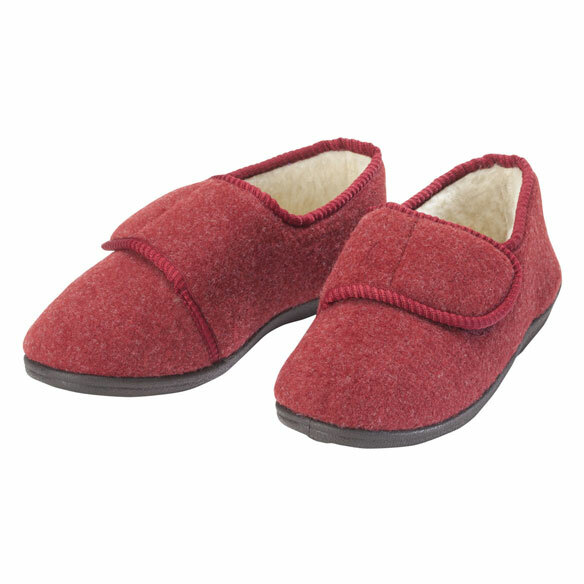 Women's slippers includes adjustable hook-and-loop closures. Heathered-look upper and non-skid rubber bottom. Sturdy soles insulate against cold, hard surfaces. Choose by women’s shoe sizes: X-small (6.5), small (7.5), medium (8.5), large (9.5) or X-large (10.5). LOVE THESE! My feet are dancing! I'm so glad that my internet search yielded these beauties. They are a very reasonable price, too, compared to others I've seen. The outside is made of something that reminds me of the boiled wool used in blazers (think Talbot's/LL Bean) that are quite expensive. I bought an XL. I normally wear a size 10 and these JUST fit. If they had them in a larger size, they might have given me a little room, but maybe I shouldn't have a feel of roominess in this type of slipper. I had previously worn "slip on" slippers & I found my feet were strained, trying to hold onto the shoe (like you might feel wearing flip flops....you need the muscle to clench your foot to hold them on!). I am on disability and home most of the time, and these are just perfect for me (I'm 60, and a young 60 at heart!). When I first put these on, my foot felt well taken care of, and the rubber contoured bottom literally made me dance!! One word of advice would be that it's probably best to wear these with socks to keep them nicer longer. The inside is a fleece sort of material & might stick to your foot if socks were not worn. I may even buy another pair of these for the future when these are too worn....I wouldn't want to take a chance that they wouldn't be available when I wanted another pair. I'd be devastated!! These slippers are a really good buy. These slippers are comfortable, but provide ample support while I'm relaxing around the house. I purchased these slippers in my usual size but they run small and are not wide enough to be comfortable. A bit hard to get on as they stretch to fit. The materials seem to be substantial for the price. I will be returning them. Needed slippers designed to stay on securely. I hope these work out. Nice feel and great traction. Slipping out of shoes is an issue. This appears to be a very sturdy and secure slipper for someone who has foot and balance issues. Can't wear most shoes, I plan to try these. Comfort. Easily donned by nursing staff on paralyzed patient. My 95 year old client loves red. These shoes will make her happy. they are adjustable and hard soled for when we do our walking. Looks very comfortable and will form to your foot. Purchased for mom in a nursing home. Like the Velcro. I need a nice looking, sturdy easy-on shoe after my hip surgery. This looked just right. Hope it is. Mother is in a nursing home. She thought these would be easy to wear and get on and off. Love red! I have a narrow foot so I can tighten it so it won’t cause me to fall. It’s cute! Hope it fits. I'm on medication that causes my feet to swell and I need adjustable slippers, plus I have neuropathy which makes my feet feel eternally cold. I have wide feet to begin with, and sometimes suffer from edema as well. Hopefully these will do the trick with the adjustable closure. If my shoe size is 8 should I order the 8.5? BEST ANSWER: I bought these for my Mom...they seemed small on her. Hope this helps. The description says "hook and loop" closure but, the picture looks like velcro. We want velcro. Which does the shoe come with hook and loop OR velcro? BEST ANSWER: Thank you for your question. It is velcro, Velcro is a trademark name our manufacturer cannot use. Some manufacturers refer to velcro as "hook and loop"...hope this helps. Would like this slipper in MEN's? BEST ANSWER: Thank you for your question. This shoe is for women only, we do not offer it in men's. We hope this information will be of help to you. What shoe size is Large? what size is small median? BEST ANSWER: Thank you for your question. They only come in maroon. We hope this information will be of help to you. Is size Med. an 8? BEST ANSWER: Thank you for your question. Medium fits about a 8.5 women shoe size. We hope this information will be of help to you. can I wash these shoe's? BEST ANSWER: Thank you for your question. They can be hand washed and spot cleaned. We hope this information will be of help to you. How wide is the sole of the shoe? My foot is wide and it swells during the day. BEST ANSWER: It can be adjusted pretty wide. My mother has one foot that swells on occasion and the shoe can be adjusted to accommodate the degree of swelling very easily by the Velcro top.